Ridgefield resident and former weekend news anchor for CBS Evening News, as well as ABC’s Good Morning America, Morton Dean is one of the most passionate reporters I have ever met. You might say, investigative journalism is in his blood. When he was a (very) young reporter operating out of a small radio station in Mount Kisco, NY, he did something budding news correspondents just don’t do; something bold, brave, and uncanny. The "notch" was a feat that would set Dean apart from his media comrades. He was about to go to extreme lengths to interview a powerful dictator in the early days of his regime - the man’s name was Fidel Castro. 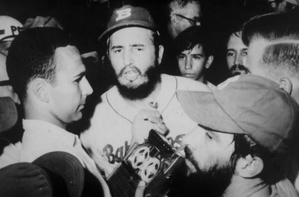 The Cuban leader, a lifelong baseball enthusiast who was regarded as a solid pitcher, participated in some exhibition games shortly after assuming control over Cuba. Dean’s plan was to confront Castro at a ballgame. “It was a ballgame to raise funds and awareness of a Castro initiative to seize land from wealthy landowners,” says Dean. Linguistically Ill-equipped to interview a foreign leader, Dean admits he only knew a few words of Spanish when he made the leap off the spectator stands after the game ended and pushed himself through the crowd until he came face-to-face with Castro, (large) tape recorder in hand. Young and wild and free. Dean says it was his desire to become a “globe-trotting news correspondent” that ignited his journalistic fire - one that drove him to Cuba to interview the Cuban leader. Castro died a few days ago, on November 25 in Santiago de Cuba Province, Cuba. The photo here of Dean (left) with Cuban revolutionary Camilo Cienfuegos Gorriarán and Fidel Castro, was taken on July 24, 1960. A day Dean hit a homerun (at least figuratively).